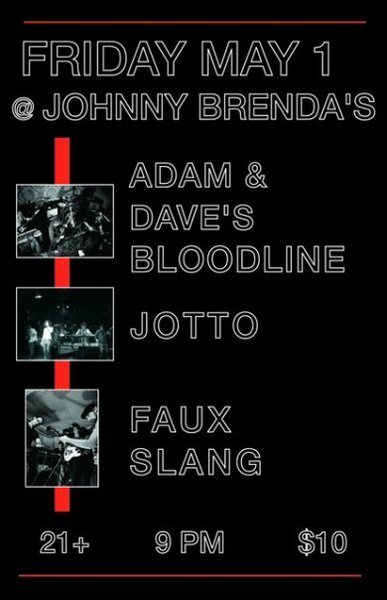 I’m a little behind in getting this info up but it’s not too late to save yourself from melting into the couch for the night on this somewhat gloomy evening and getting on down to Johnny Brenda’s in Philadelphia for the CD release party for Adam & Dave’s Bloodline‘s kicking new disc Boycott Classics. I’ve had the privilege of listening to it the past few weeks, and Adam & Dave and the band have made a record that truly combines the depth of their diverse influences, from punk rock to motown to new wave and all points in between, with the raw power of their live shows. If you’re digging things like Gaslight Anthem or The Hold Steady you’ll want to check out this one. I’ll unabashedly proclaim it one of 2009’s great rock and roll records. So, check out Nothing To It, one of my favorites off the record and then get yourself down to Johnny Brenda’s for one hot rock show. 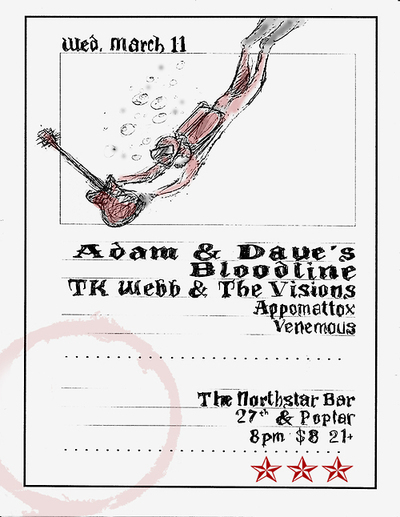 A Bag Of Songs exclusive early preview today from Adam & Daves Bloodline’s upcoming Boycott Classics album. 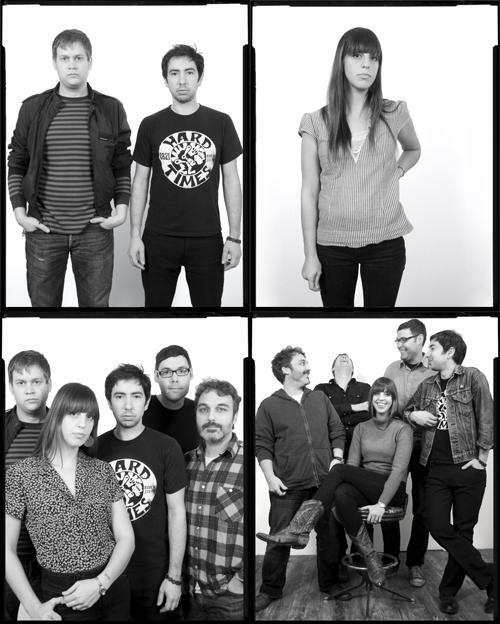 In The Zoo is a soaring slice of power pop filled with the sound of chiming guitars that urge you to turn it up as soon as it comes on. Last year’s New Age Boredom EP was among the year’s best releases and based on this one the full length followup is sure to be excellent as well. Boycott Classics is due May 12th, but in the meantime you can catch them live at The North Star in Philadelphia next week. The band is also promising a big CD release party when the date nears so stay tuned. Some photos from this past Sunday’s Bag Of Songs night at the M Room in Philadelphia. Fantastic sets from RunRunner, Secret Life Of Sofia, New Motels and Adam & Dave’s Bloodline for an enthusiastic and appreciative Sunday night crowd. If you missed this you missed a hell of a good time. Big, big, thanks to all of the bands, the M Room, and everyone who came out on a Sunday for making it a hugely successful and fun night. 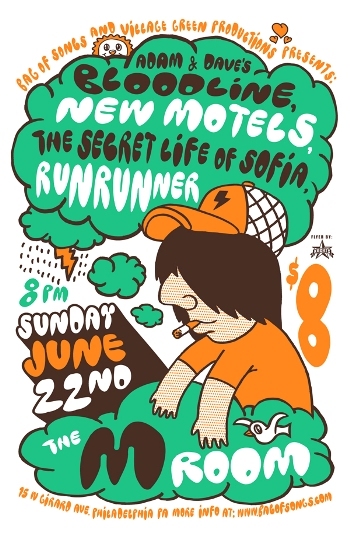 This Sunday, June 22, M Room in Philadelphia is where you’ll want to be when Bag Of Songs Presents three of Philly’s finest: Adam & Dave’s Bloodline,New Motels and RunRunner along with Brooklyn’s Secret Life Of Sofia. This should be one amazing night of music that you don’t want to miss. To commemorate this special event I have copies of the limited edition signed and numbered silk screened posters(shown above) designed by artist Jason Kochis, FREE, for first 25 people to arrive. Check out more of Jason’s awesome poster and design work at his website (www.jasonkochis.com) He’s created posters for Superdrag, Nada Surf, The Donnas and more. 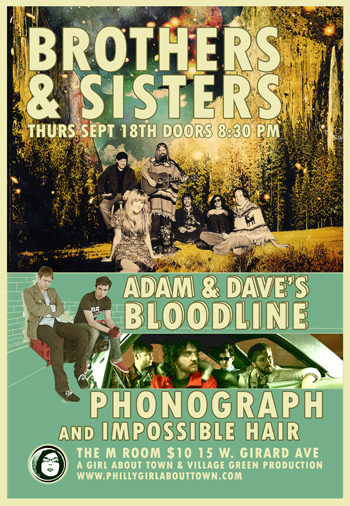 Some brand new music today from Adam & Dave’s Bloodline. A couple rocking songs from their just finished New Age Boredom EP which was mixed by Bill Moriarty who has also worked with Philly’s Dr Dog and Man Man. 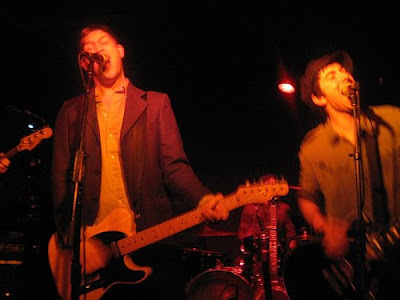 They’re playing the NXNE Festival in Toronto this weekend and will be back in Philadelphia to headline the Bag Of Songs night at The M Room next Sunday, June 22 along with New Motels, Secret Life Of Sofia and Run Runner.